The diagnostic tool is capable of activating/reading 98% of known TPMS sensors, reading and clearing TPMS codes, displaying manufacturer-specific TPMS Relearn procedures for all vehicles, performing OBDII Relearns and programing MX-Sensors to replace OE sensors. The automotive scanner is compatible with most of the domestic, Asian and European vehicles, 1996 and newer. 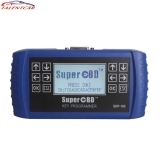 The scan tool can read/clear codes for all available systems, and supports many special functions, such as: ABS/SRS, EPB Service, Oil Reset Service,SAS Service, TPMS Service and DPF Regeneration Service,ect. The intuitive user interface makes using the device effortless through a 7 -inch LCD touch screen that displays at 1024*600 quality. English, French, German, Spanish, Portuguese, Dutch, Polish, Swedish, Korean, Italian. It allows you to do TPMS Check, TPMS Diagnosis,Sensor Programming, and TPMS Relearn. Perform reset for the Engine Oil Life system, which calculates an optimal oil life change interval depending on the vehicle driving conditions and climate. The Oil Life Reminder must be reset each time the oil is changed, so the system can calculate when the next oil change is required. This function has a multitude of usages to maintain the electronic braking system safely and effectively. The applications include deactivating and activating the brake control system, assisting with brake fluid control, opening and closing brake pads, and setting brakes after disc or pad replacement. The Battery Management System (BMS) allows the scan tool to evaluate the battery charge state, monitor the close-circuit current, register the battery Figure 6-8 Sample EMF Star-up Screen 3 84 replacement, activate the rest state of the vehicle, and charge the battery via the diagnostic socket. The Diesel Particle Filter (DPF) function manages DPF regeneration, DPF component replacement teach-in and DPF teach-in after replacing the engine control unit. The ECM monitors driving style and selects a suitable time to employ regeneration. Cars driven a lot at idling speed and low load will attempt to regenerate earlier than cars driven more with higher load and speed. In order for regeneration to take place, a prolonged high exhaust temperature must be obtained. In the event of the car being driven in such a way that regeneration is not possible, i.e., frequent short journeys, a diagnostic trouble code will eventually be registered in addition to the DPF light and "Check Engine" indicators displaying. A service regeneration can be requested in the workshop using the diagnostic tool. Steering Angle Sensor Calibration permanently stores the current steering wheel position as the straight-ahead position in the steering angle sensor EEPROM. Therefore, the front wheels and the steering wheel must be set exactly to the straight-ahead position before calibration. In addition, the vehicle identification number (VIN) is also read from the instrument cluster and stored permanently in the steering angle sensor EEPROM. On successful completion of calibration, the steering angle sensor fault memory is automatically cleared. As an anti-theft device, an immobilizer disables one of the systems needed to start a car's engine, usually the fuel supply or the ignition. This is accomplished by radio frequency identification between a transponder in the ignition key and a device called a radio frequency reader in the steering Figure 6-29 Sample Codes Screen 100 column. When the key is placed in the ignition, the transponder sends a signal with a unique identification code to the reader, which relays it to a receiver in the vehicle's computer control module. If the code is correct, the computer allows the fuel supply and ignition systems to operate and start the car. If the code is incorrect or absent, the computer disables the system, and the car will be unable to start until the correct key is placed in the ignition. The IMMO service can disable a lost vehicle key and program the replacement key fob. One or more replacement key fobs can be programmed. Note: If you are not sure wheater your car is supported or not, please feel free to contact us, we will check and teach you how to check it.